City near Cordova, Spain, magnificently situated, and surrounded by strong walls and wide moats. In early times it was inhabited almost exclusively by Jews who had arrived together with its founders; hence it was called "Jews' City," an epithet applied also toGranada and Tarragona. 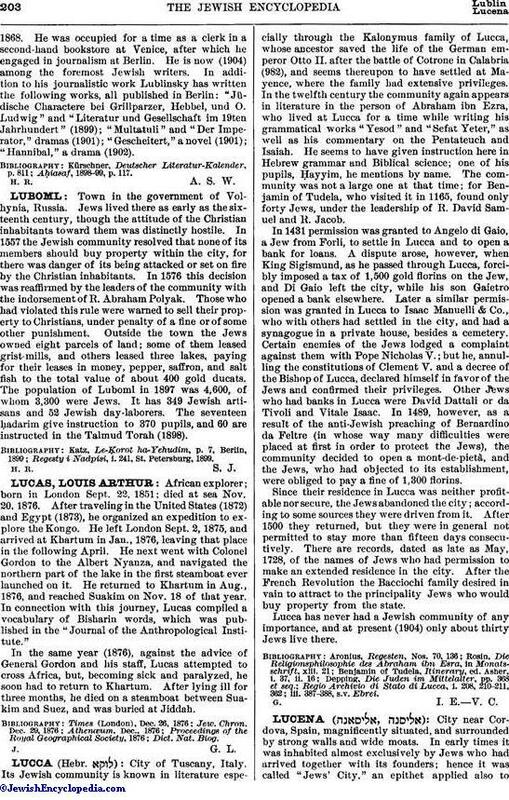 The Jews of Lucena, who carried on extensive trade and industries, were, according to an Arabic writer, richer than those of any other city. They enjoyed the same freedom as their coreligionists in the large Mohammedan cities. Their rabbi, who was elected by the entire community, was granted special privileges, and acted as judge in the civil and criminal cases arising in the community. The Jews lived peaceably until the Almoravides came into power. A certain faḳih of Cordova pretended to have discovered a tradition according to which the Jews had entered into an agreement with Mohammed that they would embrace Islam at the end of the fifth century after the Hegira. 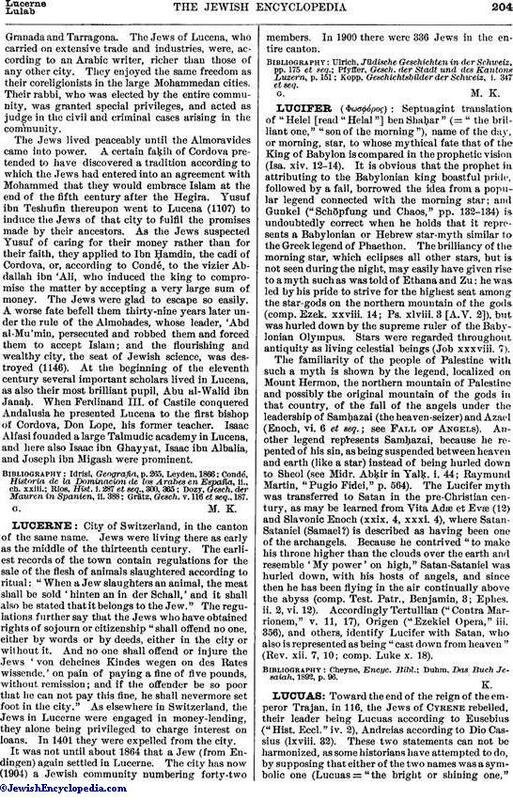 Yusuf ibn Teshufin thereupon went to Lucena (1107) to induce the Jews of that city to fulfil the promises made by their ancestors. As the Jews suspected Yusuf of caring for their money rather than for their faith, they applied to Ibn Ḥamdin, the cadi of Cordova, or, according to Condé, to the vizier Abdallah ibn 'Ali, who induced the king to compromise the matter by accepting a very large sum of money. The Jews were glad to escape so easily. A worse fate befell them thirty-nine years later under the rule of the Almohades, whose leader, 'Abd al-Mu'min, persecuted and robbed them and forced them to accept Islam; and the flourishing and wealthy city, the seat of Jewish science, was destroyed (1146). At the beginning of the eleventh century several important scholars lived in Lucena, as also their most brilliant pupil, Abu al-Walid ibn Janaḥ. When Ferdinand III. of Castile conquered Andalusia he presented Lucena to the first bishop of Cordova, Don Lope, his former teacher. Isaac Alfasi founded a large Talmudic academy in Lucena, and here also Isaac ibn Ghayyat, Isaac ibn Albalia, and Joseph ibn Migash were prominent. Grätz, Gesch. v. 116 et seq., 187.